A mortgage broker, realtor or a lender can help you to get pre-approval for a mortgage. 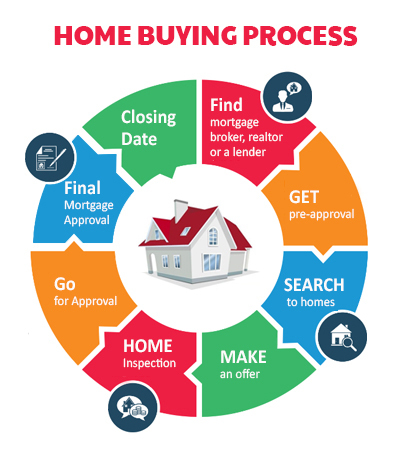 A mortgage pre- approval is the most important step before buying a home. It will help you to get filtered information as realtors will show only those homes which are within your price range. They will look into your finances and affordability to provide the best advice. In order to determine how much you can afford to borrow to purchase a home, your lender will ask you a series of questions and you will need to provide some supporting documentation along with detailed credit application and authorization to review your credit file. Any of the documents required for pre-approval are proof of employment/income, down payment/equity etc. Mortgage pre-approval makes it easy for you to search for homes for the options within your budget. You need to provide required supportive documents for pre-approval to the realtor or lender. One should ask for a pre-approval certificate from a bank or mortgage broker, so that they were not surprised at the time of final approval. It is important to note that though pre-approval is immensely helpful, it doesn’t bind you to any particular lender. On pre-approval, you can request lender for the rate - hold to safeguard yourself from rising interest rates. It doesn’t guarantee that your final mortgage will be approved because sometimes lenders may not like the property you want to buy. House shopping is exciting as well as a tedious task. It is advisable to narrow your search down to homes that appeals to you and are within your pre-approved price range. Where You Can Begin To Search For A New Home? If you are working with a realtor, they will arrange for you to visit the house to see if it is fitting your needs. You should consider home’s energy rating, utility costs, property taxes and major repairs for comparison of various homes as it will affect your monthly housing expenses. If you like any home and you want to make an offer to purchase, what should be the price to offer for purchasing it? Just because the seller and their neighbour both are asking same price for similar properties, it doesn’t mean it is the market price of it. It is important to conduct an extensive research on your part to know the right price to be offered for buying a home. If you are working with a realtor, they will help you to share information on comparable homes that were recently sold in neighborhood. One should ask realtor to set up an automatic email alert to get information on new listings in your target area, style, and price range. You can also get email alerts for property sold in your targeted area. Names: The name of the buyer and seller and the legal civic address of the property. Price: The price, buyer is offering to pay for a home. Other conditions: It should include any item that one thinks to be included in it such as window coverings and appliances. It should also include other conditions if applicable, such as home inspection report, property appraisal and lender approval of mortgage financing. Date of expiry of the offer: The buyer usually gives 24 hours to the seller to accept his offer and otherwise it expires. If any change is made into contact any time, it has to be initiated by all parties to be valid otherwise entire a seller can either accept or reject the offer or can also present counter offer to the buyer. Contact will be dead with no obligation on any party to revive it. If the offer is accepted by the seller, he needs to specify the buyer to make initial deposit within a day or two via cheque. Such cheque is issued to real estate brokerage trust account or a lawyer's trust account. A home inspection is executed after you have made an offer to buy a home, but before you have committed to buy it. Home inspection is executed after you have made an offer to buy a home but before you have committed to buy it. A buyer should preferably make an offer to purchase conditional on a home inspection. Your offer to buy a home is usually conditioned on financing and you need to get your mortgage approved to finalise your home buying process. First of all, you need to provide a copy of purchase agreement to your mortgage broker or bank. It should be complete and signed. Once the purchase agreement is received, mortgage professional will review it and check for all other documents and submit to the best mortgage lender/product for you. Lenders usually revert back within 2 or 3 after receiving your purchase agreement. If the lender is interested in providing you a mortgage, he will provide a conditional approval along with a list of documents that you are required to provide to support your application. The lender's "underwriter" will then review all the documents. If any further document is required you should respond ASAP. If all loan conditions are met, lender gives final approval and sends "mortgage instructions" to your lawyer's office. Your realtor will then communicate the seller in writing that the mortgage approval condition (and any other conditions) of your purchase are satisfied. Once your mortgage is approved, you should make arrangement to hire movers, utility connections in new home, fire insurance for new property etc. Closing date is the day when you get a legal possession of the property. You need to meet your lawyer a week or two before the closing date, so as to sign the necessary documents. On the closing date, your lender will give the mortgage money to your notary. You must give the down payment (minus the deposit) to your notary. You must also give the remaining closing costs. Your notary pays the vendor and the home is registered in your name and you will get keys and land title to the property.